That Johann Heinrich Schmelzer (c.1620/23-1680) is a highly original composer of beautiful, profound and distinctly special music cannot be said often enough. He's all too often overlooked, though, in favor of the other giants of the seventeenth century. Here's a splendid new CD on Harmonia Mundi from the eminently successful and accomplished ten strong Freiburger BarockConsort to make the point yet again. A subset of the leading Freiburger Barockorchester, the Consort (which plays here without a (named) conductor or director) was formed specifically to present the music of less well known composers, and the less familiar music of better known composers from the seventeenth and early eighteenth centuries. The ensemble oozes enthusiasm and excitement. But not for a second at the expense of immense technical and interpretative competence, excellence of playing and exuberant yet measured presentation. You'll be struck by the vivacious, expressive, joyful yet precise and "contained" playing of the Consort in the eleven items ranging from two-and-a-half to nine-and-a-quarter minutes in length on this well-recorded CD. Schmelzer's music has the same delight in chromaticism and fruity sonorities as does Monteverdi's and Purcell's… it's full of color and variety, contrast and surprise – without spurious effect. The Balletto di Zeffiri [tr.9] is a good example. Like similar pieces on the CD it has immediacy, sinuous yet purposeful lines of melody, interesting textures and a real thrust. 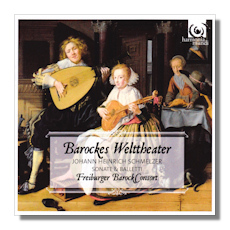 The Freiburger BarockConsort obviously understands the world which it inhabits, its blend between folk and art idioms, the place in the evolution of Baroque music as instrumental combinations changed and solidified, the relationships between solo and collective development and the contribution which these made – individually and severally – to the music's impact. The tempi which the Consort employs are perfect… there is interest, intrigue and yet just the right sense of familiarity in the dance movements' progression. Again, we know we are in very firm hands here as the members of the Consort articulate the whole and the parts of each piece. The highly distilled Sonata a due Violini scordati [tr.10], for instance, is as full of musical ideas as the more burly ensemble items; yet it's here played with an equivalent amount of sensitivity and fine touch. This collection of music reflects the various purposes for which it was written: dances, court entertainment, imitative and experimental (almost) – like the Serenata con altre arie [tr.1] and Sonata (Battaglia) à 7 [tr.11] – laments and plain airs for the sheer beauty of them. Again the Freiburger BarockConsort's playing could not be more impactful, sensitive and enjoyably convincing. Instruments are crisp yet work in tandem with others to form interesting and pleasing textures. Rhythms are spot on. The alternation between (types of) work adds variety to the CD's pace. A delight from start to finish! The acoustic is firm, clear and buoyant. It complements the subtlety and tenacity of Schmelzer's rounded writing well. The booklet carries essential information. Although about half these items are available on other collections, this is an excellent CD to get as an introduction to Schmelzer's instrumental work – so high is the standard of playing. It's also an entirely enjoyable and worthwhile set of recordings in its own right. Warmly recommended. Copyright © 2012, Mark Sealey.